This recipe is from a regional magazine which I read regularly. It was a welcome change from the normal wheat rava upma. Even the upma haters of my family enjoyed this simple and healthy pulao. Heat the oil in a pan and add cloves, cinnamon, birinji leaves, mint and sauté. Then add the onion, veggies, tomato, garlic, chillies and turmeric and sauté. Now add the water and salt. Once the water boils, add the rava and cook till done. 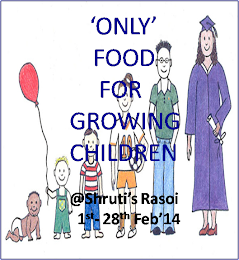 This recipe sent to Cook click n devour's c'mon chefs cook up a main dish event and only food for growing children at shruti's rasoi started by Pari.